We specialise in antique clocks, barometers and barographs. Our business has been established for ten years and is located in Northamptonshire, close to the Rutland border. We carry a varied stock including longcase clocks (also known as Grandfather clocks), fusee wall clocks, Vienna wall clocks, bracket clocks, French mantel clocks, carriage clocks, art deco and art nouveau clocks, stick barometers, wheel barometers and barographs. There are always clocks and barometers in our workshop undergoing restoration and we may have just what you are looking for. Please phone 01536 772161 or e-mail us at sales@antique-clocks-uk.co.uk and let us know your requirements and we will do our best to help. You can browse through a selection of the antique clocks and barometers that we currently sell by clicking on Examples of Stock. You can zoom in on any of the photographs contained in our page of clocks in stock by clicking on the relevant photograph. For background information on mantel clocks, wall clocks, bracket clocks, carriage clocks, Vienna wall clocks, Art Nouveau clocks, Art Deco clocks, longcase clocks, barometers and barographs please click on Information. All our antique clocks and barometers are sold with a guarantee unless sold in unrestored condition. Prices of longcase clocks include delivery and setting up within the local area. This includes the counties of Northamptonshire, Lincolnshire, Leicestershire, Rutland and Cambridgeshire. We also purchase antique clocks and barometers in any condition. 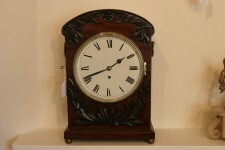 You can arrange to see our full stock of antique clocks and barometers by appointment. Please telephone 01536 772161 and ask for Tony Sheffer. Some of our antique clocks and barometers are also on display in Uppingham at Uppingham Antiques Centre www.uppinghamantiques.com.